Indeed. it seems that it would be quite hazarous even. The Cozy seems quite happy @MAUW @8,000ft remaining S&L on 50hp. (tested on X-Plane et al) so 100hp per side might be ok.
You are never straight and level with a failed engine in a twin. You are either in an uncoordinated bank, or you are in in an uncoordinated yaw. If you try to fly straight and level in coordinated flight you end up going crash and boom. That alone increases your power demands as your drag goes up. You also need to have enough power to maintain airspeed so you can have rudder authority (Vmc) if you need to climb... as to how much airspeed this, I dont know. I'd never build a twin without having featherable props. The single engine performance is already lacking in 99% of twins, so why take away even more by having a fixed pitch prop that is still producing a lot of drag even when stopped. 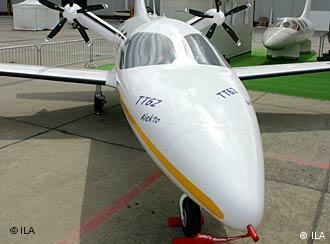 I've wondered what the performance of the twin ez would have been if it had constant speed propellers? If memories serves, the single engine performance was terrible. But I heard that second hand. I noticed the twin Velocity model was on display again this year at OSH. I didn’t catch the guys name but someone at their booth said they are working on finishing it before the end of the year. See my post #16 on this thread to see the pictures of it. hmmm, engines are on the wings.. any comment on wings vs pods (alekto stylin) ? I think pods (assuming you mean underwing) would increase your chances of a prop-strike dramatically. I think if you are going to do it, wing/spar mounted as close to the centerline of the aircraft as you can get without the prop tips touching is the best way to go... just my opinion though. Jon, what Steve meant was the HPA TT62 Alekto aircraft with V-twin pods/nacelles on its tail, just for the props. The engines were in the tail section of the fuselage. The design fell short of expectations, and the new TT62 Baltic design is configured like almost any other twin, with engines in the wings, kind of like a bigger Diamond Twin Star. kind of like a bigger Diamond Twin Star. Jon, what Steve meant was the HPA TT62 Alekto aircraft with V-twin pods/nacelles on its tail, just for the props. Yes, this is correct. Lazy me, heres an image so that it is abundantly clear. That is very interesting. What were the issues ? It seems optomistic to me to have all those transmissions. I wonder about two direct-drive aircooled engines in nacelles out there, instead of those geared units. hmm, it seems there is a CSU propellor manufacturer here in NZ IvoProp style. Amazing. A money-back guarantee too. I've also read more about it in some German aviation magazine. I had high hopes for this aircraft as it would have been the first application of the brand new TAE Centurion 4.0 turbodiesels. It seems the pylon is too large and/or too close to the prop, and the rising turbulent airflow off the wing is entering the prop disc, aaaaand on top of that, the spiral flow off the props is entering the stabilator. How unlucky can you get ?? I wonder why they didnt just swap to pusher configuration. Maybe that would be worse. Well, the Cozy doesnt have a rear stabilator behind the engines, and the pylon can be smaller because it doesnt contain radiators or driveshafts, and we can choose tractor or pusher config. Any ideas on avoiding the rising turbulent(?) flow from the lift surfaces ? Mount props higher and further forward ?